NOTE: information on the 2008 Navigation Weekend is available here. Mystic Seaport a few weeks ago on a cloudy day. See if you can find any signs of the 21st century. Friday through Sunday, June 16-18, 2006, the Mystic Seaport Planetarium in Mystic, Connecticut will be hosting a "Celestial Navigation Celebration" devoted to preserving the art and practice of celestial navigation. Celestial navigation enthusiasts and practitioners as well as professional and private historians of science will be meeting to discuss the history and future of celestial navigation. Events of the "Celestial Navigation Celebration" weekend are free of charge and open to all. If you plan to visit other exhibits at Mystic Seaport while you're here (and you certainly should! ), then you would need to purchase regular museum admission or a museum membership. Details here: www.mysticseaport.org. Some events during the weekend are sponsored by the Susan P. Howell Memorial Fund. If you're planning to attend, please e-mail FrankReed@HistoricalAtlas.com so that we can have an accurate head count. Please note that all events and speakers listed below are subject to change and cancellation. It should be a lot of fun, and we hope to see you there! Meet the navigators. Get your name tag and meet and socialize with the participants and speakers. As time permits, we'll have opportunities to tour the planetarium and the Susan P. Howell Classroom facilities. Bill Peterson, Senior Curator of Mystic Seaport, and Don Treworgy, Planetarium Director, will conduct a tour of some of the navigational instruments in the collection of Mystic Seaport. Many of these instruments have never been displayed publicly. This is also an opportunity to see Mystic Seaport's impressive Collections Research Center, a major addition to the museum, completed in 2002. Lunars, the Other Longitude, part I. Frank Reed will present an overview of the history of longitude by lunar observations covering the basic principles of this famous navigational technique focusing on the myths of lunars, both pro and con. Herbert Prinz, a private researcher with extensive expertise in historical astronomy, will discuss some of the mid 18th century developments in the history of celestial navigation, in particular La Caille's solar tables. Shooting lunars, weather permitting. Take your own lunar distance sights and find your longitude the way Nathaniel Bowditch did it 200 years ago. It's close to Last Quarter so the Moon will be descending in the west while the Sun is climbing high in the southeast. Bring your sextant, if you have one. We will also have sextants available for those who don't bring their own. Please car pool as much as possible. 1100-1215: Lunch. There are good options in Stonington as well as central Mystic and also at Mystic Seaport. Ian Jackson, retired professor and an arctic explorer in his own right, will be discussing the journals of the arctic whaling voyages of William Scoresby, which he has been editing and analyzing for the Hakluyt Society. Ian will discuss some of the challenges of arctic navigation in the early 19th century including finding latitude by the midnight Sun "below the pole". Ian has been collaborating on this project with George Huxtable, known to many navigation enthusiasts for his perceptive, incisive analyses of many navigational topics. Trudy E. Bell, science and technology journalist and prolific author, will be discussing early longitude determinations in the United States. Amongst her many publications, Trudy has written articles for Smithsonian's "Air & Space" and "Sky & Telescope". Lunars, the Other Longitude, part II. Frank Reed will continue his discussion of longitude by lunar observations. In this session, Frank will be focusing on the math and technicalities of lunar distances incuding the five clearing methods published in Bowditch's American Practical Navigator in the 19th century. This talk will include some math. Don Treworgy will conduct a planetarium presentation discussing the history of teaching celestial navigation at Mystic Seaport. He'll demonstrate the ease of explaining circles of position using the planetarium projector. Don will also take us to arctic latitudes to demonstrate some of the principles raised earlier in the day by Ian Jackson. Our keynote dinner speaker is Ken Gebhart. Widely known in the world of celestial navigation, Ken is the founder and owner of Celestaire, Inc., the world's biggest seller of sextants and just about everything else required by navigators. Ken will talk about the origin of his business and some of his experiences as an entrepreneur. Shooting lunars (second opportunity), weather permitting. Take your own lunar distance sights and find your longitude the way Nathaniel Bowditch did it 200 years ago. It's close to Last Quarter so the Moon will be descending in the west while the Sun is climbing high in the southeast. Bring your sextant, if you have one. We will also have sextants available for those who don't bring their own. Please car pool as much as possible. 1130-1245: Lunch. There are good options in Stonington as well as central Mystic and also at Mystic Seaport. Craig Waff, a historian with a resume that stretches from JPL to Air Force One, will speak on the history of the prime meridian in the 19th century US. He will discuss the influence of practical navigators who actively opposed an Americanized Washington meridian. Luis Soltero, mathematician and software developer, will tell us about the development of his popular "StarPilot" celestial navigation software. A group sextant workshop, hosted by Don Treworgy. Bring your sextant. Bring your stories. This is an opportunity to exchange advice on buying and selling sextants as well as adjusting and maintaining them. Frank Reed will collimate your sextant telescope or show you how to do it yourself. Door prize drawing(s). You must be present to win! Mystic, Connecticut is easily accessible. It's a straight, forty-minute drive from T.F. Green Airport south of Providence, Rhode Island which is served by frequent inexpensive flights on Southwest and other major airlines, and it's just a mile from Exit 90 on I-95. Mystic is on the main Amtrak train line between Boston and New York City. 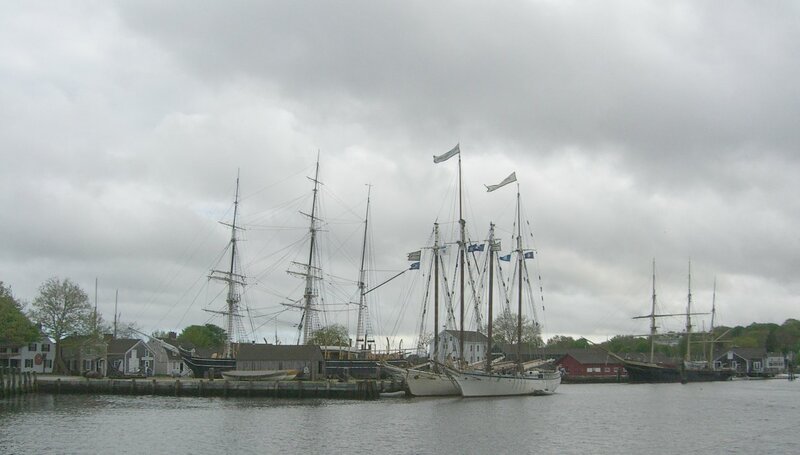 There are numerous motels, hotels, B&Bs, and other accomodations close to Mystic Seaport. While you're in the Mystic area, consider visiting the nuclear submarine Nautilus at the Sub Base in Groton. The Mystic Marinelife Aquarium and Center for Exploration, in Mystic near the highway is also impressive. And for a little adventure, take the high-speed catamaran ferry from New London to Block Island. Legal disclaimer: Mystic Seaport, Frank Reed, Don Treworgy, and other participants in the Celestial Navigation Weekend cannot guarantee any of the events, activities, or participants in the Celestial Navigation Weekend. All events and activities are subject to change at any time. Participants are responsible for their own travel, food, accomodations, and other expenses. Admission to activities listed above is free of charge. All other activities at Mystic Seaport require museum admission or membership.